Another alleged ghost story, but not quite a ghost story. It is set in 1954 in the East Riding of Yorkshire amongst the old airfields of world war two, now abandoned and beginning to crumble. Dunmore write well about Britain just after the war, with rationing still in place and in a small town. The shadows of the war are long and still strong. It is a straightforward story. Isabel and Philip are newly married. Philip is a newly qualified doctor and they have moved into their first flat together in a strange new town. Philip, whilst caring is a man who feels his wife should not work. Isabel is in a new town with no friends and feels a bit like a piece of china wrapped in cotton wool. There is also a strange and rather uncommunicative landlady. The flat is cold (we are before central heating) and Isabel finds an old army greatcoat in a cupboard. Using the greatcoat for warmth Isabel starts to dream and one evening hears a knock on the window. Outside is a young airman, who seems to want to come in. Initially she does not let him in (Philip is out on night calls). Eventually one evening she lets him in. Isabel often walks during the day and a few miles away is an abandoned airfield which she occasionally explores. One day it is a fully working airfield; I think at this point I might have questioned in some way what was happening, perhaps even sought help? The airman is called Alec and is the pilot of a Lancaster bomber (it is a bomber base nearby). An affair develops. The reader is given some clues about what is going on and the timeline is all over the place. It didn’t at any time seem like a ghost story although there were chilling moments.There are a few good unveiling moments and Dunmore does capture some aspects of post war life very well and the description of the derelict airfield is very good. The portrait of Philip, an essentially good man who wants to help society, but who is constrained by his upbringing and his notions of what a woman should be and do is very well written. He is trapped by the dominant ideology and unable to think outside of it; Isabel recognizes this and when an opportunity seems to present itself, she takes it. There is a choice to be made at the end as Isabel begins to see what is happening. On the whole though the story is without real depth and there are too many plot contrivances which solve a little problem. Reception has been variable and I suppose that reflects how I feel about it. It was ok but no more. If we consider The Novella Club's definition that a novella has fewer than 200 pages, then The Greatcoat should certainly be viewed as one. And seen as novella rather than novel, it might be received better by readers for its slender but powerful story. Like James' great novella, Turn of the Screw, The Greatcoat is a ghost story, but it's also a romance, a story of new marriage and passion found not within but elsewhere. Dunmore creates a subtly haunting dreamy atmosphere that permeates the page and bleeds off, into our lives. At least it did in mine. Somehow she captures the dreamy state women and girls are especially prone to, an anticipation of romance, of sexual longing, of these two being very much intertwined. I remember being caught up in this state particularly in the summers when I was age 15 and 16, feasting on Thomas Hardy and Andrew Lang's editions of fairy tales...dreaming myself into these books and beyond their pages. Yet the novel is also very much grounded in a particular time and place, a Yorkshire small town in post-war 1954.I had originally given the novel 3 stars but its lingering effect, the way that Dunmore is able to capture this dreamlike state so effectively, along with her convincing evocation of that time and place, made me rethink it and add another star. What a haunting, chilling yet beautifully constructed ghost story. I had never heard of this before picking it up but I'm SO glad I took a chance on it (mostly I'll admit because of the cover) I found this to be elegant and extremely atmospheric, I can't stop thinking about it now it's over. As you all know, I love a ghost story, and The Greatcoat started off as a very good example of the genre - perfect for those times when you want a book you can instantly get stuck into and devour in one sitting. It centres on Isabel, a young woman who has recently married and moved to an unfamiliar Yorkshire town with her husband Philip, a doctor. Struggling with the boredom and loneliness of her new role as a housewife, Isabel is repeatedly drawn to an abandoned airfield just outside the town. Then she finds an old RAF greatcoat at the back of a cupboard, and on the same night, a mysterious - but strangely fascinating - man knocks on the kitchen window while Philip is sleeping. So begins a very strange affair and a series of haunting events which seem to have no rational explanation. Dunmore's writing is excellent throughout, creating a cold, tense atmosphere and making you sympathise with Isabel. I was sucked into the story and all set to give the book a four-star review. But then... then I came to the ending, and it's safe to say I was left frustrated and confused. (view spoiler)[Did Isabel actually die? Was there really a 'crack in time', or was this just a memory repeating itself? The fact that Isabel actually slept with Alec and may have become pregnant by him seems to suggest the former, as does the fact that Isabel glimpsed the younger version of the still-alive Mrs Atkinson, but if Alec was a real person who was 'out of time'... surely he'd have noticed Isabel wasn't the woman he was looking for?! I really didn't understand how the power of Mrs Atkinson's memories could 'bring back' Alec, or why - if she was able to do this - she would choose to send him to a woman she disliked rather than bringing him back to her. And anyway, if that was the case, this book is being completely misrepresented because it's obviously a time travel story and NOT, as the blurb claims, a ghost story! Rant over. (hide spoiler)]I would nevertheless still recommend this book if short, atmospheric, spooky stories with a historical setting are your kind of thing. I really liked Dunmore's style and found the characters well-rounded and believable. Just don't expect the ending to answer any questions you might have about how all of this came to happen! ﻿The Greatcoat is more a story of lost love. Yearning for the past than it is a traditional scary ghost story. People from the past coming to the present stuck in a loop that will forever hold them. The story did not scare me as such but, Isabel's isolation as the newcomer in town weighed heavily on me. Her husband Philip fell comfortably into his role as the new doctor. However, Isobel found life a lot harder having to endure stares and whispers from nosy women. I also felt the suffocation of realisation when she finally figured out who Alec was and what had brought him to her. Having the world you know fall away from you with no one to turn to or confide in only made her already miserable life worse. Despite the heaviness, Isobel's story was a very easy and enjoyable read. The author's ability to weave a story that draws the reader into the lives of her characters became apparent to me. I was unable to put the book down until I had discovered the fate of Alec and Isabel. A hauntingly beautiful tapestry of the past and the present intermingling.At the conclusion of the book, there is an Afterword section from the author on how the book came into being. It was very interesting reading and brought more depth to Isabel and Alec's tale. 2.5 StarsI was really looking forward to reading "The Greatcoat". I was hoping it would be an atmospheric, romantic ghost story, and although very different, written with the same richness and depth as 'The woman in Black' by Susan Hill (my favourite ghost story of all time). Unfortunately, it didn't really deliver. "The Greatcoat" is a ghost story set in Yorkshire during the Second World War and the 1950s. It's a strange little novella in that to me it didn't have much of an atmosphere at all, which is what I expect from a ghost story. It wasn't eerie or creepy. I did, however, think the author managed to capture the essence of Yorkshire quite well and I could visualise the house and street where Isabel and Phillip lived.Isabel and Phillip are married and move into a house with a rather grouchy landlady. Phillip is a doctor and is working long hours, leaving Isabel alone for long periods of time. The house is cold and one evening Isabel finds an old greatcoat, which she uses to keep warm, and thus begins the ghost story...I felt that all the characters were very superficial, especially Isabel. They didn't have any depth to them and I didn't get to know them at all. Isabel's husband Philip and her lover (and ghost) Alec, were also a bit on the flat side and rather uninteresting. I didn't care about them, which made the reading of this novel slightly hard going. The character that did pique my interest was Mrs Atkinson, the landlady.The romance between Isabel and Alec just didn't capture my imagination or my heart and unfortunately I didn't become emotionally attached to either of them. Half the time I didn't know who Isabel was and so I couldn't fully invest in their relationship.Isabel's narrative was difficult to follow as it alternates between her true self and someone else entirely. I think I have an idea what the author was getting at, but ambiguity is not to my taste. There's also a fair amount of repetitiveness with Isabel doing and saying the same things again and again. The structure of the story is also irritating as it jumps about far too much, which made it feel disjointed.Although I didn't particularly enjoy "The Greatcoat" I continued reading with the hope that the ending would make all the preceding pages worth while, but sadly the ending was abrupt and obscure.VERDICT:Unfortunately "The Greatcoat" wasn't what I expected, which was disappointing, and the writing style wasn't to my taste. I couldn't connect with the characters or their relationships with each other. However, this is just my personal opinion - you may love it! Right I will start by saying that there are some great reviews of this book which go in to greater detail on the book. This as usually is more my thoughts and musing after completing reading the book.I will admit that I have heard a lot about this book both from the fact it was from Helen Dunmore an established and renowned author to the fact it was published under the HAMMER name - yes the relaunched brand which has also re-spawned the film line of the same name. This is a book from a larger and varied selection of titles all published under the HAMMER brand. SO as you can imagine I was both eager and a little cautious on reading this book especially when it was presented as a ghost story.The story itself is very British (not maybe as much as the Christmas Ghost stories of MR James and the like) since it was based actually in the year of Helen Dunmore's birth but also the fact it was based during the years immediately after the Second World War a time my parents have told me many a story from.There is a lot that can be said about the book but unfortunately it references to the storyline but what I can say is that I agree with some of the reviewers who felt that the ending was rather ambiguous - for me I think it was intentionally so however it is easy to see how it could have left frustration in that you don't quite know what actually happened (I know the supernatural is not meant to be explained away but its never a good idea to leave confusion in the void that leaves behind).One thing I would say is that although it was incredibly atmospheric I am not sure how chilling a ghost story it was - I have read a good few of them and I didn't feel that chill as I have with others. It seemed at times Isobel was more concerned about fitting in to the local women of her town than she was explaining all the strange goings on. That said the premise is a beautiful one and one I have seen used before (the events linked to physically item) so if you are looking at a period drama linked to a ghost story then for the 50s I think this story works. I am glad I read it now but I am not sure how quickly I would return to read it again. New direction from Helen Dunmore with a ghost story. It is 1952 and Isabel and Philip Carey move into their new home together - a ground floor flat with a creepy landlady. As Isabel struggles with becoming a wife, and Philip is busy with his job as a doctor, they begin to lose touch. When Isabel discovers an old RAF greatcoat in a cupboard, she begins to have memories - but are they hers? Then someone comes tapping on the window... Not a scary story, but moving and atmospheric. Chose this one for my ghost story for October and was not disappointed. Have a rather love, hate relationship with Dunmore, some of her novels are brilliant and others not so much. This one is a solid ghost story, set in Yorkshire, about 6 years after the end of the war. Not everyone seems to know the war has ended though and while this is was not a terrifying read, it was chilling enough for me. Some people just cannot seem to move on. I really enjoyed reading this book and felt that the word used by The Times on the quote featured on the front cover of this edition; "elegant" was exactly the right word to employ in describing it. This is an elegant story, deftly constructed with - as you would expect from an author of Dunmore's calibre - good use of language, excellently realised characters and a strong plot which leads you forward and into the story. It is NOT - as The Times also claim - a "flesh-creeper" and nor is it really comparable to "The Woman in Black" as they also state. I did not find this story "creepy" at all (and I'm a complete wuss when it comes to ghost stories), although there is plenty of atmosphere evoked from the flat East Riding landscape and the desolate abandoned airfields. It also lacks the malevolence of The Woman in Black. There is no evil inherent in this story at all. Indeed, if anything, it is more a tale which affirms the durability of the human spirit and love. Yes, it is tragic - so many lives cut short and then so easily forgotten in the human race's rush to replace those which were lost; but it is still, essentially, a love story.Some reviewers have commented that they found that Dunmore was forcing the action forward. I noted this too in the scene where Isabel first finds The Greatcoat. Here, the scene seemed a little too laboured and overwrought for my taste. I didn't really pick up on it elsewhere though. Indeed, there is a paragraph where Alec considers the experiences he has gained in the air: "either you came back or you didn't, and if you did you came back with new, sharp, hot fragments of knowledge. It all had to fit together. It had to be remembered instant by instant. He had to hold it all in his mind, so that it wasn't even like thinking any more, it was all there without him having to think about it." (pp 151-2) and it struck me that it was a similar experience whilst reading the book - fragments of knowledge were being drip fed to you, but with such a light hand that somehow you just knew what was coming and what had been without realising how you had initially aquired this knowledge from the preceding pages. I also didn't find the story in any way unbelieveable - which is perhaps surprising considering the material; but, as I have said, the characters (even the ghost) are strongly realised and so vivid to the reader that, as Yann Martel once wrote of the perfect characters, they practically have a pulse and need a birth certificate (again, even the ghost! )In short, this is a great ghost/love story. Like all Dunmore's novels, reading it is an emotional experience and one well worth investing in. There is something so elemental about a ghost story, something that speaks to one’s deepest fears and desires, that a reader can’t help being drawn in. 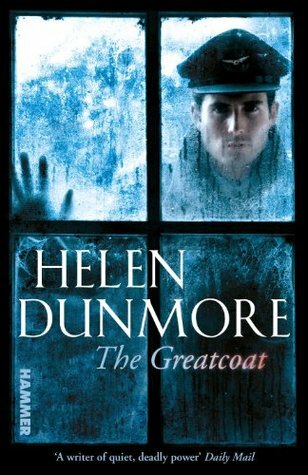 The Greatcoat, by Helen Dunmore, is exactly that kind of a ghost story. I couldn’t put it down from the moment I read the first page (okay, I had one night of sleep in between) and finished it in two days. This is a simple, well-written story about a ghost, manifested through a Royal Air Force standard issue coat, who links himself to the life of newlywed Isabel Carey in post-war Britain. Isabel, who has just wed Philip Carey, struggles to fit into the mould of a respectable, middle-class, country doctor’s wife and navigate through all that a new marriage brings. When ex-RAF pilot Alec comes knocking on her window, Isabel finds him to be a welcome presence, as she gives in to another’s memories. What really manifests through their relationship is the reality of the deeply buried trauma of a country that couldn’t really mourn its huge loss of life during the second world war and rushed instead to bury its dead and rebuild. But, can history be so easily forgotten? Isabel’s own haunted past is remembered through the presence of Alec as she struggles with her own history, identity and sense of belonging. Alec is a ghost of the past, clinging desperately to any sense of life that he can, trapped in a nether world by one of his personal effects and an overpowering sense of loss. As I was drawn in to Isabel and Alec’s world the story became less about other beings and more about the past’s inability to ever remain silent. This rich, evocative offering by Dunmore will titillate all your senses and keep you hooked, as much as bring you into shadowy life of post-war Britain, trying to maintain a stiff upper lip after surviving so much death, destruction and loss. I don't think its fair to compare this book to 'The Turn of the Screw' or 'The Woman in Black' although it is of the same genre. Yes, it's a ghost story and is full of the techniques that create a good ghost story, titillating all the senses. What I liked about it was that it makes the reader question the link between the ghost and the haunted. There were many abstractions that made me wonder what was going through Isabel Carey (the haunted one's) mind and even the end is left open, in my opinion. Its more of a novella than a novel and should be read as such - ideally in one, long go. I was in the mood for a good ghost story and Helen Dunmore delivered. Dunmore has a fascinating style. She writes quite obliquely and doesn’t over-explain. The reader has to let the story wash over them, confident that the meaning will evolve. It’s an act of faith.Set in the fifties this is a story of a young woman’s possession by a World War Two airman, although Dunmore doesn’t let her tale take obvious routes or arrive at an expected outcome. Although this is her first published ghost story she has an innate understanding of what the story needs in order to work. She has a poet’s sensibility and her writing has a meticulous structure as the reader begins to question reality and the influence that the past exerts on the present. Dunmore makes a conscious authorial decision that her protagonist won’t be frightened by the airman, despite his provenance, which doesn’t quite ring true. Her acceptance of him into her life and her bed is the one area that jarred slightly, although this didn’t spoil my enjoyment of the book.Beautifully constructed and elegantly delivered this short novella will resonate with you long after you close the final pages. Isabel and her husband move to the East Riding where she's left alone while he's off doctoring. One day she finds an old RAF greatcoat in a cupboard and when she uses it to keep warm, an airman appears in her life. Is he real, a ghost or a time-traveller? This was quite gentle even if it was about a haunting. Very readable and easy to whizz through. I love Helen Dunsmore's novels, but this did not pull together. A young 1950s housewife, by accounts easily intimidated in her new town, hears a rapping on her window, sees a strange man and let's him in - no motive! This is a ghost story, and the characters felt dead. I'm glad I didn't pay full price for this book. It was short, had huge holes in the plot and was generally a little weak. Not Helen Dunmore's best. I started this book just before going to bed and the first three chapters created such a strange aura that I was afraid to set the book down with the front cover showing. As I turned out the light, I knocked the book to the floor and knew, just knew, it had landed with the picture of the airman facing up. That's the kind of book this is. Has a power of its own. I felt like it let me recall things I could not have known, and I had a sense of what my mother's life might have been like, being a young woman during World War II. This story reaffirmed that feeling many of us have, of a place being charged with a kind of simultaneous past and present, with the dead and the living brushing sleeves as they pass.I looked up the author, Helen Dunmore, and found that she was born in the same year I was, 1952, the year she chose as the time of this story. I was sad to see that she died this year. I had hoped I could follow her through new books but instead, I will certainly try reading all the ones she has left behind. I don't read any horror stories (including living-dead stuff), nor ghost stories very often. I really enjoyed this then, although I thought it more a "break in the fabric of time" rather than a ghost story, but nevertheless, the haunted becomes as intrigued by the haunter as I did. Very short, and worth the read. Short but very atmospheric historical ghost story. Would've liked the plot to have been a little bit clearer, but very good writing. The year is 1954 and although the war has been over for 9 years Britain is still a bleak place with the remnants of abandoned military bases dotted in the landscape, rationing determining what people can get their hands on and daily comforts being few and far between.Isabel Carey has recently married Philip who is a GP and together they’ve moved to a Yorkshire town where he starts his medical practice. While Philip is happy with his new career and surroundings, Isabel can’t seem to settle. She feels like everybody she meets in the town is judging her and can’t stand the apartment they’re renting, which is impossible to keep warm, or her landlady who lives on the floor above them and seems to spend all her time pacing from the door to the window and back again. This noise keeps Isabel awake at night and makes her uncomfortable.One night, while Philip is out working, Isabel can’t shake the cold and searches the house for something to keep her warm. When she finds an old greatcoat at the back of a cupboard she takes it down and finds that it keeps her deliciously warm and allows her to sleep. That sleep though is filled with very vivid dreams. When a knock on her front window wakes her up she is scared when she sees a young handsome Air Force pilot staring at her through the window. She quickly closes her curtains but when she opens them again for a second look the man has gone.It isn’t long before the pilot is knocking on her window again and mouthing her name. This time curiosity wins out over fear and Isabel lets him into her house. To her amazement Isabel discovers that although she has never met this man named Alec before, he seems to know her. And somehow Isabel develops memories about him and his relationship to her as they spend time together. Memories that are vivid and very realistic, although she knows that they can’t be hers.Soon Isabel finds herself in a passionate affair with Alec while uncertain as to what is real and what isn’t. Because her affair with Alec seems to be taking place during the war rather than in the present while there are manifestations of his visits in her life with Philip.And all the time her landlady continues her walking from the front door to the window and back again.This is a fascinating ghost story. The reader has no more of an idea as to what is really happening and what is supernatural than Isabel does. As Isabel slowly pieces together who Alec is and why he is visiting her, so does the reader, and when it seems that all the questions are answered and the haunting has been brought to a peaceful end there is still one more disaster to avert.In many ways this was as much a love story as a ghost story. Although the way in which the ghost takes over Isabel’s life and memories is spooky, it is never heartstoppingly scary because at no point is there the impression that the ghost has anything but love for the woman he’s visiting. On the other hand, the reader is only too aware that consorting with one who should have departed can’t lead to anything good and can only hope that Isabel will figure that out too, before it is too late.Helen Dunmore has written a beautiful and haunting story which draws the reader in to England in the late 1950’s. Her descriptions make the greyness of the surroundings and the harshness of life at the time come to life and her characters are realistic. The thing I appreciated most in this book though is that the author didn’t try to give logical explanations for everything that happens in the story. Some things remain unexplained or uncertain, leaving the reader with much to wonder and fantasise about after the last page has been read.This book is published by Hammer, better known for its horror movies, through Random house and there will be more original ghost stories to follow. If this book sets the standard, then this is one publishing innovation to look forward to and embrace. I write this review as an unashamed Helen Dunmore fan, though having said that I do not give five stars lightly and have not given five stars to all of her novels but I do feel that here it is justified. The Greatcoat is marketed as a horror story and even carries the Hammer logo on the spine, a logo that still carries a lot of memories of fantastic though low budget horror films for those of my generation. It is a ghost story in the tradition of classics by MR James, Henry James, Charles Dickens and Wilkie Collins and at times is reminiscent of the spookier side of James Herbert but it is not a horror story in the traditional sense. If there is a horror element to the novel it does not come from the ghosts in 1952 but from the reality of war in the 1940s. No physical horror can outstrip the looks of despair and resignation on the faces of Alec and his crew as their 27th mission approaches, no psychological torture is worse for the crew than the continually cancelled ops forcing them to wait and wait for the order to go. In this Dunmore is revisiting the territory of what is probably her most 'horrific' novel, The Siege with the claustrophobic settings and descriptions of the deprivations and hardships suffered in the Russian winter by the citizens of Leningrad during the Second World War. There have been comparisons drawn in other reviews between The Greatcoat and Susan Hill's The Woman in Black and I can understand why there may be a thematic link drawn between the two, however the main problem that I have always had with The Woman in Black is that within the context of its time it doesn't work as a horror story because the doom of World War One is just around the corner. With that novel I find every time something supposedly horrific happens to a character I want to shout at them 'Oh man up, you'll be dying in the trenches in a few years, how will you cope there if you're frightened of a face at a window?' By setting The Greatcoat seven years after the end of the war Dunmore has avoided this problem of context by showing that actually after living through the war Isabel is not going to be phased by the appearance of a ghost. Initially she is welcoming of the visits by Alec and even towards the end you get the feeling that she is more irritated by him than scared of his ghostliness. Dunmore has said that Isabel is a person who could be haunted because of the life she had lived up to that point and I think that this is the truest sense in whichThe Greatcoatis a ghost story. It makes no difference whether Alec is a ghost or whether he is still alive and meeting Isabel for real in 1952, Isabel is always going to be haunted by the war and by her missing parents. It was this haunting that made her rush into a marriage with Philip, a relationship that has far more potential to do lasting harm than the relationship with the dead Alec. This situation is reminiscent of that facing Simone in Dunmore's earlier work Your Blue Eyed Boy where the haunting by ghosts from her past is real rather than supernatural but a haunting nonetheless.The Greatcoat is a great book and Dunmore has achieved more in terms of developing character, drawing location and establishing motivation in a short novella than many other writers can achieve in far longer works. One of her best. I am a Helen Dunmore fan, no doubt about it. Although her novels aren’t especially propulsive, I still find her work compulsively readable. She is particularly gifted when it comes to creating believable and sympathetic characters and her novels are moody and atmospheric. Her latest novel, The Greatcoat, caught my eye in the horror section – of all places.Isabel Carey is a young bride who has moved to Yorkshire with her husband, Philip, a doctor. They’ve been married just two months and this move to Kirby Minster is isolating: it’s a small town where they are clearly outsiders, Isabel is somewhat socially awkward and “bookish” and although she considers finding some work, Philip doesn’t think it would be acceptable for the wife of the town’s newest doctor to be employed. It is 1952. Although the war is over, both Isabel and Philip ”had been children of wartime and all they asked of food was that it should fill them up.” Good thing: Isabel is a terrible cook and food is still scarce and often unpalatable. Isabel is clearly out of her depth. She is “a little girl pretending to be her mother.”Isabel and her husband take a flat in the home of Mrs. Atkinson, a woman Isabel dislikes on sight. The flat is cold and grey and their landlady is constantly pacing the floor over their head. There is something decidedly menacing about her.One particularly cold night, Isabel roots around in a closet looking for something extra to put on the bed and discovers an old greatcoat.It was a coat. An RAF officer’s greatcoat, she saw at once, recognising it with a thud of memory. There was the heavy, slatey grey-blue wool, the buttons, the belt with its heavy brass buckle. It had been folded up a long time, she thought.The coat does provide warmth, but it also brings a visitor. A man comes to her window:She saw the pallor of his face first, as it seemed to bob against the glass, too high up to belong to a man who had his feet on the ground. The street lamp lit him from the side, throwing the sharp shadow of his cap over his face. He was too close, inside the railings that separated the house from the pavement. Of course, the level of the ground there was higher than the level of the floor inside. That was why he seemed to float in middair. A man in a greatcoat.From this point in the novel, Dunmore elegantly weaves past and present as Isabel succombs to loneliness and the thrall of the past.The Greatcoat was published under the Hammer banner (horror aficianados will recognize Hammer as the British production company behind films like The Woman in Black and Let Me In. They’ve entered the world of publishing in partnership with Arrow, a subsidiary of Random House. It’s nice to read a “horror” story that is less about blood and guts and more about the kind of chills which prickle your skin and send a shiver up your back. There are no mosters here, but The Greatcoat is deliciously creepy nonetheless. This is published under the new Hammer imprint and is Helen Dunmore’s first foray into ghost stories.To me it read more like a romantic fantasy with time travel involved and a very slight brush with the supernatural. Helen Dunmore is a fine writer and I enjoyed her book set in Leningrad during the time of the siege but ‘The Greatcoat’ felt slight. Its length works against it as it is more like a novella.Set in 1952 in a small Yorkshire town, Dunmore deftly evokes that grey period after the 2nd World War in which it seemed that rationing would go one forever. Newly married Isabel and her GP husband Philip have moved into rented rooms. Philip doesn’t want her to work and is keen to make her happy. But Isabel distrusts their landlady and is soon bored with domesticity and the daily round of shopping and gossip. Increasingly the landlady takes on a sinister aspect as she paces up and down the floor above their rooms. Meanwhile on one of Isabel’s visits into town she starts to explore the nearby abandoned and derelict airfield which is destined to play a much bigger part in her life. The rooms are cold and while rifling in a cupboard for a blanket, Isabel finds an RAF greatcoat instead pushed to the back. She pulls it out and puts it on the marital bed. It isn’t long before she hears a tapping at the window when she’s alone and looking up sees a young RAF pilot looking in at her. He seems to know her name and she lets him in. Too late Isabel realises that the coat may have been put into the cupboard for her to find and that its discovery has set events from the past in motion again as she and the young pilot, Alec, embark on a doomed love affair. An affair which the landlady seems to have been involved in…….Brought up on Robert Aickman and M R James I have high expectations of a ghost story. The literary ghost story can be achieved and achieved well as with Sarah Waters’ The Little Stranger’ and Henry James’ ‘The Turn of the Screw’. But it didn’t work so well here as it seemed such a slight tale which could have been so much more. It never really came to life for me although the detritus of the airfield and the young married couple trying to find their place in the world and together was well portrayed. A reviewer on amazon described it as more of short story rather than a novel and I did agree to some extent.It was ultimately disappointing. Alec and Jimmy prepare for their 27 flying op over WWII Berlin. Alec hands Jimmy a ten-bob note – his winnings from a bet involving three WAAF and a bicycle. He puts it in his locker with a very special letter he has written to his wife and child, because he thinks they'll come back. Alec puts on his lucky gloves, climbs into his aircraft and takes off. Fast forward to 1952, and Isabel – newly wed to Philip, a hard-working doctor – is trying to make a new home in an old, dreary flat with shared facilities and a forbidding, sinister and downright unfriendly landlady. Lonely, neglected and feeling the cold; Philip is working all hours and is constantly on call, Isabel knows no one (having not even properly met the landlady – Philip handled all that), and considers the other lives she might have lived, whilst retreating further into the life she has chosen. One night, waking up frozen – again – the bedcovers having 'gathered on Philip's side of the bed, as they always did', she gets up to look for something else to use as a blanket. Rooting around in one of the cupboards of their fully furnished flat, she finds an old RAF greatcoat and spreads it on the bed. A few nights later she wakes from a nightmare to an empty bed – and a tapping noise from the living room window. Thinking it must be her husband having forgotten his key, she pulls the coat around her and rushes to the window. When she pulls the curtains, it is not her husband standing on the other side of the glass, but an RAF officer wearing a greatcoat exactly like the one around her shoulders. The suspense and sense of isolation and desperation builds. Who is the man? What does the landlady know? Why does she seem to delight in the fact that the greatcoat is on Isabel and Philip's bed – and why does she seem concerned that Philip would mind? 'The Greatcoat' is a superbly crafted, yet gentle ghost story. Compelling, melancholy and almost dreamily chilling as Isabel is drawn further and further in to Alec's tragic past. A past that repeats, and repeats, and repeats. The characters are well-drawn and believable with a great deal of depth; the pace is timed perfectly as the reader is pulled further and further into the fog of Alec and Isabel's worlds. The book was recommended to me by one of my closest friends – as ever her taste is impeccable and I am very happy to pass her recommendation on. It’s just after WWII; rations are still in place, food and fuel shortages are still the norm, decent housing is hard to come by, blackout curtains still hang in some windows, the bombings are still a fresh memory and some don’t realize it’s all over. Newlyweds Isabel and Philip Carey have moved in to a small rental flat in Yorkshire, where Philip is beginning his medical practice. More often than not Isabel finds herself alone in the tiny, cold flat. Looking for more blankets that she is sure the stingy landlady has hidden away, Isabel discovers a “Greatcoat” tucked into the back of a cupboard. Although it is not a blanket Isabel decides the heavy wool coat will suit just fine to keep her warm through the night. Soon enough Isabel becomes aware that the coat brings with it more than warmth and learns that sometimes people are not exactly as they appear.This was a short book, a simple story and, easily read. The scene Ms. Dunmore sets is contained; a small flat in a small village and, down the road, a deserted airfield. As far as the characters go, there are four main ones and everyone else is pretty much a walk-on. The limited cast and venue of the book aid in building the mystery and the suspense because it is clear to the reader that nothing goes unnoticed (almost). The mystery and suspense carry through to a very satisfying ending that I really didn’t see coming until, well … until the very end.